I have to say that this is one very nice looking watch. Which watch? 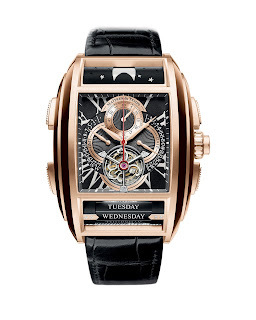 It is the Chapter One Red Gold Limited Edition watch from Maitres du Temps. Maitres du Temps is of course the watch company founded by Steven Holtzman and is based in Switzerland. It is a place where independent master watchmakers can develop innovative, interesting and exclusive timepieces. Here is one of the timepieces from them. The Chapter One, reference C1T.55.2E.12-5 is the product of two great watchmakers, Christophe Claret and Peter Speake-Marin. The most interesting aspect of the timepiece is the two display windows at the top and bottom of the timepiece. Within these windows, we find two rolling bars indicating the day of the week and moon-phase. These, on top of the following complications; tourbillon, mono-pusher chronograph, retrograde date and retrograde GMT (proper one with 24-hour scale). 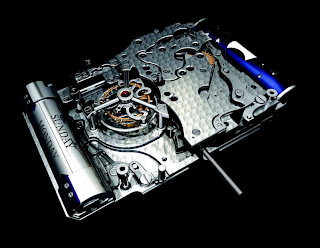 Additionally the watch is made up of 662 individual pieces, 558 pieces make up the movement and 104 pieces, the case. From the photographs, we can see that the dial is very beautiful. We have the centrally mounted hour and minute hands. The red second hand is the 60 second counter. At the 6 o'clock position we have the one-minute tourbillon and the day of the week display (via a roller bar) below it. At the 12 o'clock position, we find the 60-minute chronograph counter and above it the moon phase (again via a roller bar). The retrograde GMT is at the 9 o'clock position and at 3 o'clock, the retrograde date display. It may sound as if the dial would be very busy, but it is not. It is a brilliant idea to have the two roller displays in their own display windows above and below the main display. The red gold hands contrast beautifully against the black dial. 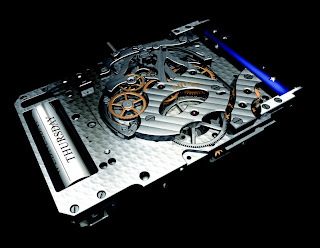 Powering this timepieces is the Maitres du Temps Calibre SHC02. This is a hand-wound movement beating at 21,600 A/h. It measures 51 x 32 mm and have 58 jewels. Power reserve is 60 hours. 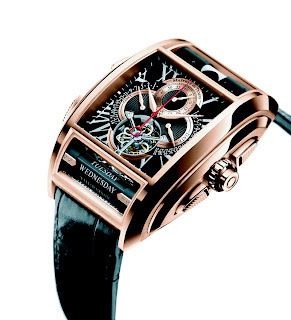 The tourbillon is a 60 second tourbillon. Finally the case. It is made of 18K 5N red gold. It comes in at 63 x 45 mm. It is 18 mm thick. All the crystals on the watch are made of sapphire crystal with double AR coating, except the crystal on the display back. Welcome to the blog. I hope you enjoy you visit here.